Some volunteer events are just plain fun. When I signed up to volunteer at Snowy Nights, I had no idea what I was getting myself into! I arrived at the Memphis Botanic Gardens around 6:00 in the evening and knew that I’d be spending the evening outdoors, so I made sure to wear my warmest coat. It seemed that all of the volunteers arrived at the same time and filed into the warm lobby to receive their assignments for the night. I’ve been through the gardens in the day time, but it’s an entirely different experience when the entire area is transformed into a sparkling winter wonderland. As we were escorted through the garden, people peeled away in small groups and headed for their stations. Eventually it was down to just two of us and the volunteer leader asked for my name. When I replied, he said “OH! You’re the Snow Queen!” I’m the what? “Let me get your costume.” Costume?! He quickly returned with a bag marked “Snow Queen” but I still hadn’t quite registered what he was telling me. Then I started laughing. I dropped the warm coat and then donned the regal Snow Queen costume: a long white dress with a hoop bottom, hand warmers, and a white hood. This was definitely the weirdest thing I’d done so far this month. 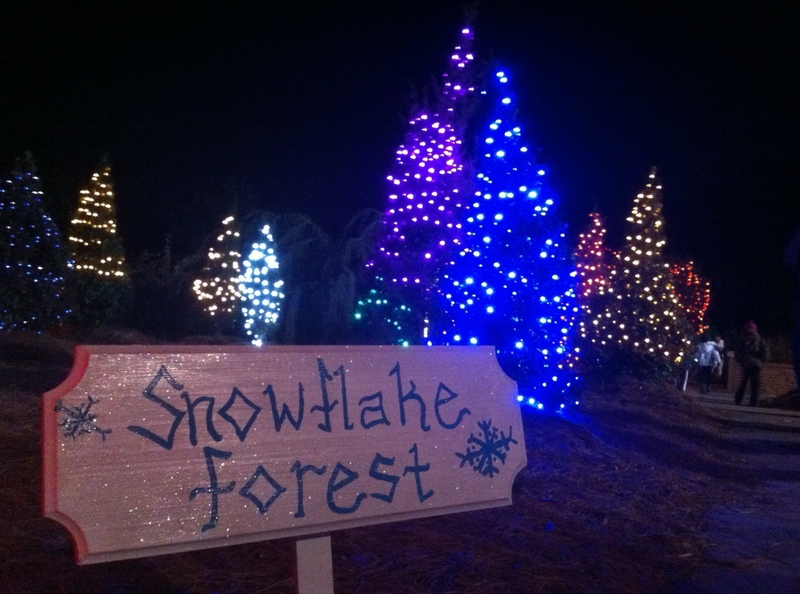 Once I got dressed, they handed me a basket of snowflake candy and escorted me to the Snowflake Forest. As the kids arrived at the Snowflake Forest, my job was to introduce myself as the Snowflake Queen and instruct the visitors to count the snowflakes hidden in the forest. 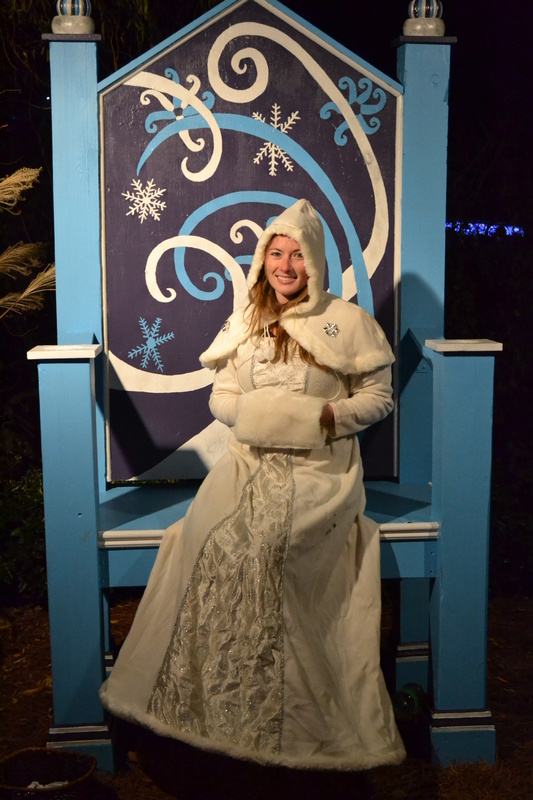 Countless parents wanted their children to have pictures with the Snow Queen in her throne. I got snot on me at least twice, candy cane goo once, and I had one kid look at me and shriek with terror. All in all a pretty successful night. Overall the little kids loved it and the big kids got a kick out of it too. When I invited my friend Ben and his new fiancé Jamey to stop by, I thought I would be meeting her for the first time while I was making s’mores or running the giant light brite. When Ben and I bumped into each other, I’m not sure who laughed harder. I have to admit that I felt pretty ridiculous at first, but after the first few kids came through, I really warmed up to the idea. After each kid went through the forest, they would proudly run out and tell me how many snowflakes they found in order to earn a piece of candy. Inevitably, the older kids would ask how many snowflakes were hidden in the trees. I would look side to side and then crouch down and lower my voice. “Can you keep a secret?” I’d ask. Incredibly, they all responded the same way – they’d move in, wide -eyed and nod intently. I whispered the answer to them and they’d exchange looks and exclaim, “That’s so many!” By the end of the evening, I was having a lot of fun. If you ever dreamed of being a princess in the Disney parade, this is the perfect gig for you. Can you also build fires, make s’mores, manage the hot chocolate, run the giant snow globe or work at the giant light brite. If you’re looking for a fun volunteer experience for yourself, as a couple, or with your kids, this would be a great fit! Attend the event or volunteer to help! 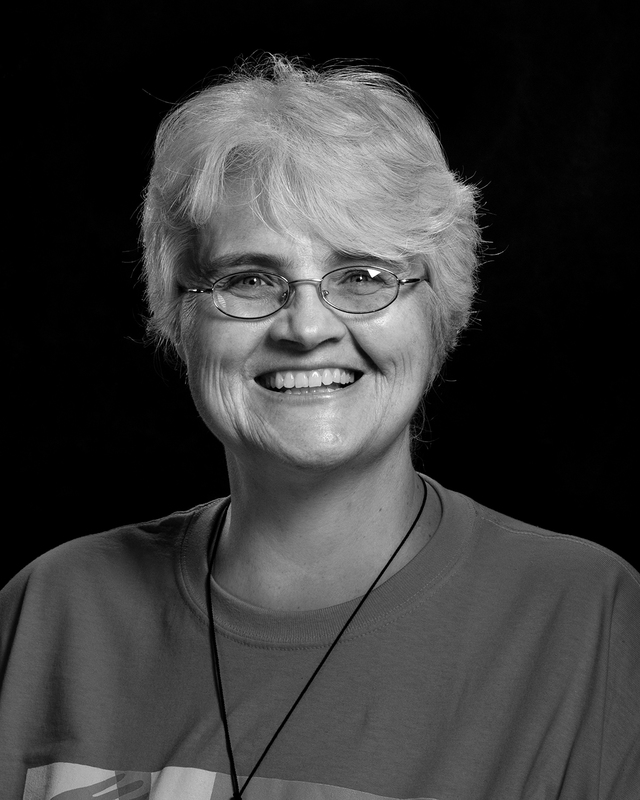 Contact Page McCoy to volunteer at page.mccoy@memphisbotanicgarden.com. Snowy Nights Friday and Saturday November 23-December 15. Daily December 17-29 from 6:00-8:30 pm. Closed December 20, 24 & 25. Many people want to give back on Thanksgiving Day and do something to help others. There are many opportunities to volunteer in the community on Thanksgiving, but there are also opportunities to do projects together as a family in your own home. Ultimately, I think we are all looking for a way to be reminded of all that we have while also helping others through difficult situations. With that in mind, my family and I planned a special project for Thanksgiving Day. Through my volunteer work I have met many people who are homeless and when I think about doing projects to help, I can picture the people I’ve met and I can reflect on their stories. Not everyone has had this opportunity and so homelessness can be a faceless, nameless problem that seems abstract. I wanted to find a way to introduce my family to the homeless people of Memphis so we could all envision what homelessness is like and what we could to do help in some small way. Fortunately, two wonderful organizations produced pictures and videos for this exact purpose. With that in mind, I’d like to share some of their work with you. Take a minute to look at Jerry. Do he look homeless to you? What do you think his story would be? This lady is named Pat. Does she fit your image of homelessness? And this is Tarvis. What is his life like? 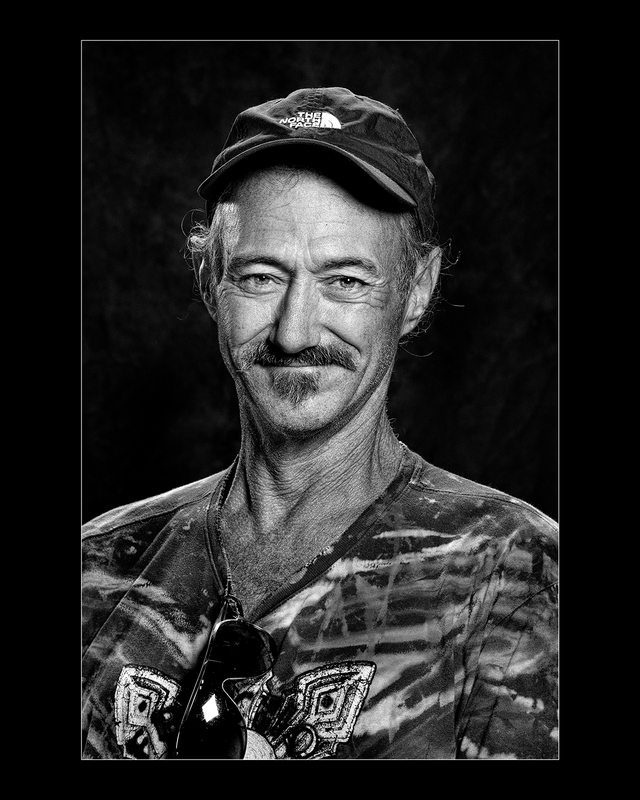 What I love about Focus for the Good is that they give a face to homelessness. Typically homeless people are treated as second class citizens and many feel invisible at best. Through this work we have a chance to see them as individuals, rather than homeless people. What makes this project even more special is that Focus for the Good and Baker Donelson teamed up to produce videos of Jerry, Pat and Tarvis. You have an opportunity to glimpse into someone else’s life and learn about their hardships. Maybe you found some parts sad or shocking. I hope you found something that resonated with you and challenged how you envision homelessness. I hope you feel inspired to help. 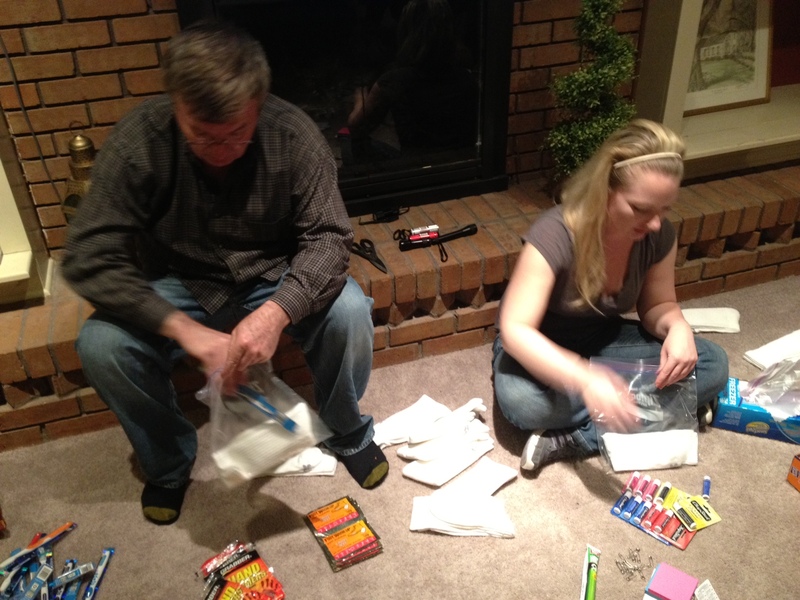 After looking at these portraits and listening to these videos, my family and I decided to make gift bags for the homeless. We talked about what items to include and what might be most useful. 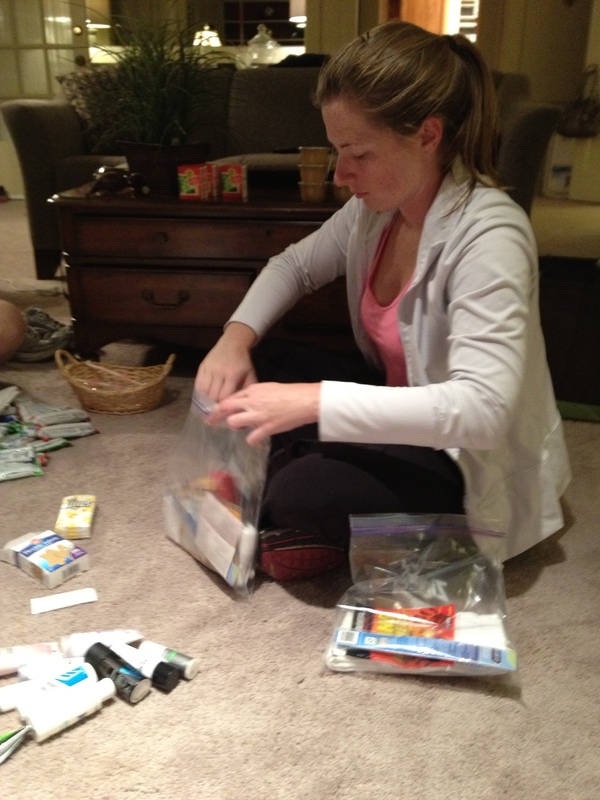 In the days leading up to Thanksgiving we collected toothbrushes, chapstick, tissues, socks, hand warmers, raisins (and other health snacks like applesauce), bandaids, and soap. My dad divided up the toothbrushes. I’m surprised he used scissors instead of power tools. 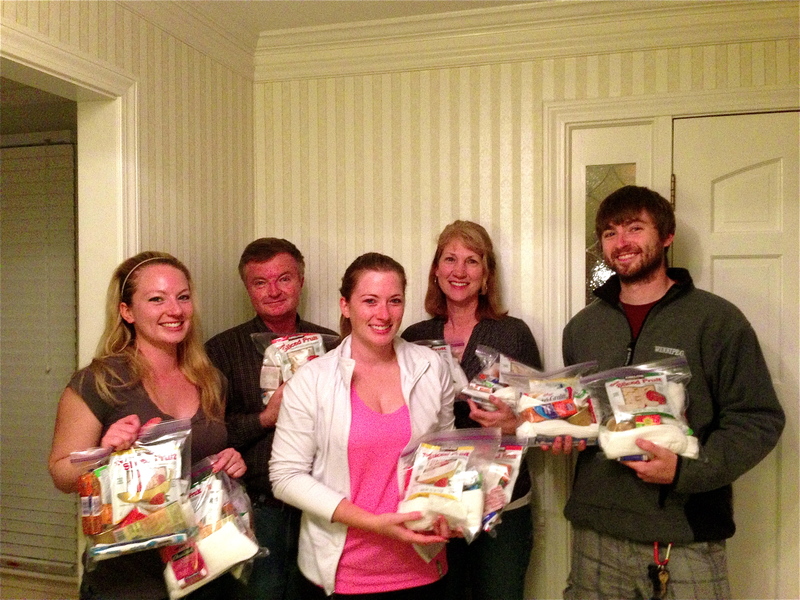 After a short while, the five of us had quickly assembled 12 gift bags to distribute to the homeless of Memphis. I’ll keep some in my car to hand out and the rest will be donated to one of the many wonderful organizations in Memphis that serves the homeless. I loved this project for many reasons. First of all, it was meaningful. Looking at the pictures and watching the videos gave us a better sense of who would would be helping and it reminded us to be thankful for our warm home and our family. Second, it was simple, but productive. 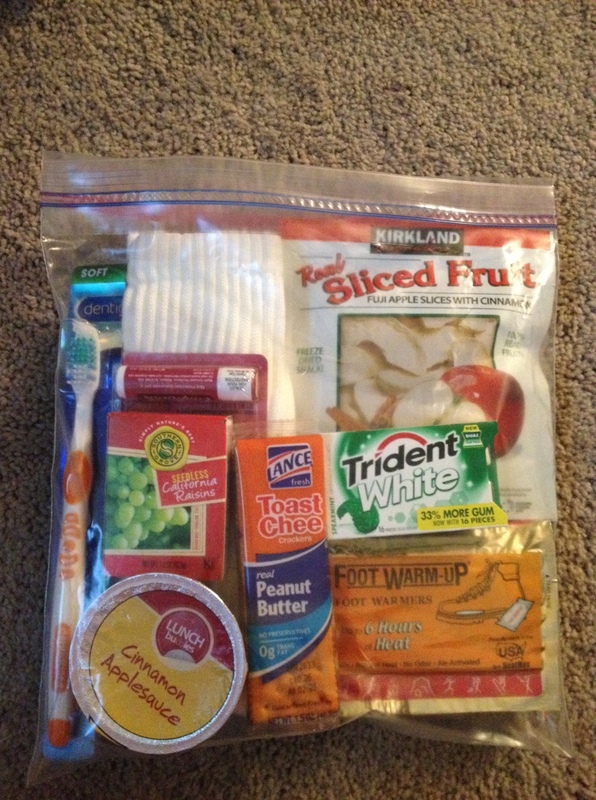 Everyone could contribute by selecting the items and filling the bags. This would be a great project for any age and any size group. Third, although we did this project on Thanksgiving Day, it will benefit 12 people on one of the other days of the year when they feel forgotten. I hope this will become a tradition for my family and for yours. It’s generally best not to include cash or gift cards to gas stations. Many people use these items responsibly, but some struggle with substance abuse and will use the funds to feed their addiction rather than for food or shelter. When planning healthy snacks, consider that many of the homeless are missing teeth and cannot easily eat hard foods like peanuts. Fruit cocktail, applesauce and soft fruit bars are more accessible for everyone. Please consider donating to Focus for the Good or hiring their incredible photography services for your next event. It was hard to get out of bed this morning. For the second day in a row I was up before the sun and running on very little sleep. I got dressed in the dark and as I pulled on my coat, I took a second to be grateful for the fact that I had one. This project is changing the way think about my world. We drove to the back door of the Food Bank and were buzzed in. I followed Ron inside and looked at the pantries. They’re so empty. Someone once told me that he didn’t believe the shelves were really bare – that it was a marketing ploy. I promise you I have seen the pantry and food is scarce. If you’re looking for 2 pound bags of candy sprinkles, you’re in luck. If you’re looking for pasta, canned chicken, peanut butter, frozen meat or fresh produce, it might be a wasted trip. Ron and I roamed the empty aisles. He scrounged what he could and grumbled about the low supplies: “This means I’ll have to buy it at the grocery store and it’s so much more expensive there.” I hadn’t realized that the food pantries around the city actually pay small handling fee for the food from the Mid-South Food Bank. I’d always thought they received it for free, but it’s still a steep discount – usually 5 to 18 cents per pound. Ron and I loaded his pickup truck and headed back to St Mary’s where the line had grown even longer. Back in the dining hall, Ron offered a tour and a glimpse into the history of the church and soup kitchen. We followed him through the winding hallway and into the heart of St. Mary’s church. 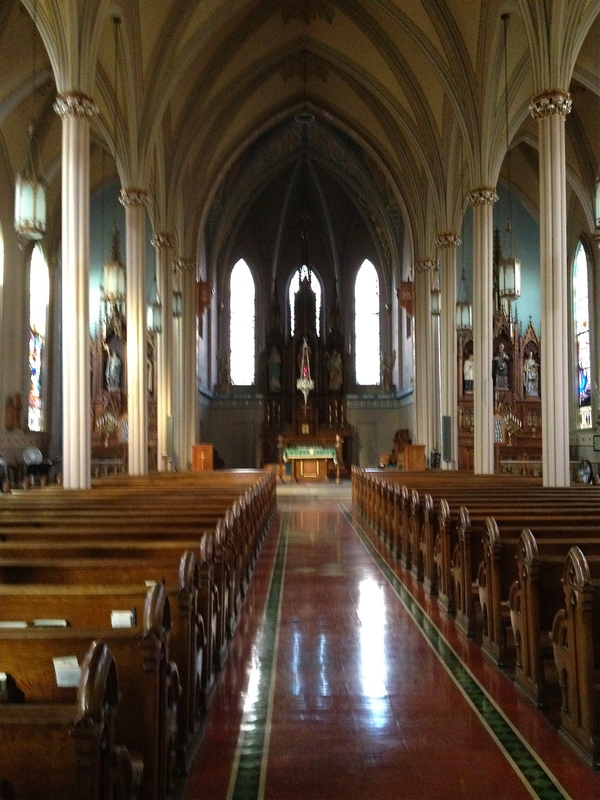 I love old Catholic churches. There’s something peaceful and reassuring about sitting in a dim church lit only by the morning sun as it filters through the stained glass. I sighed deeply and settled into the hand carved pew. Ron, who had seemed gruff just an hour earlier, sang a simple song in a clear and beautiful voice. We sat transfixed as he recited the verses. Ron is full of surprises. In the 1870’s, the monks used to feed the hungry and homeless from the back door of the kitchen. This ministry has continued continuously since that time, which makes it the longest running soup kitchen in the city. After the prayer and the tour, we made our way back to the kitchen to begin serving food from the back door of the kitchen as they’ve done for more than 100 years. The door way is narrow and elevated so one person goes out on to the landing and passes food from the kitchen down to those waiting in line. At first this distance and elevation bothered me a little bit, but I realized that it’s truly the best way to handle the logistics in the tiny space. After a few minutes, I gave up my seat so the volunteers waiting in the kitchen could have a turn to interact with the guests and so I could dive in and visit. I walked down the concrete steps and through the metal gate. Now I was among the crowd. Ron keeps things orderly and fighting off a bit of nerves, I made my way over to him so I could get my bearings. Most of this mild anxiety comes from being an introvert. It’s really hard to walk up to a group of people you have never met and strike up a conversation. But to be honest, there’s always a little bit of nervousness that comes from working with this group. About 95% are wonderful but occasionally you’ll run into someone who makes you uneasy. “It’s the 5% that ruin it for the others” Ron told me. After a while, most of the line had gotten their food and dispersed, but there was a gentleman who showed up towards the end. He looked familiar. I couldn’t place him at first – I’ve been to several soup kitchens and homeless shelters this month, but I must have a least talked with him. I asked a few questions and quickly nailed it down. 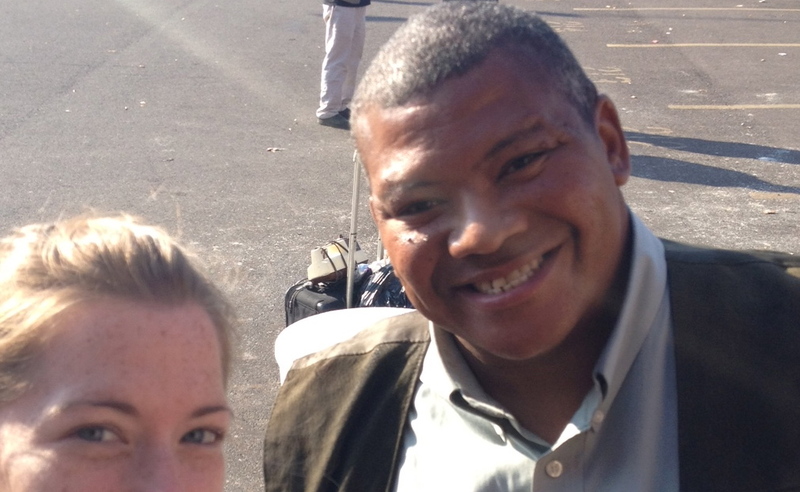 I met him a couple months ago while doing interviews of the Memphis homeless population with the Community Alliance for the Homeless as part of their 100K homes initiative. I remembered him for several reasons. When we met him, he had a broken leg and was trying to get around on crutches. This would be challenging on its own, but he also had a broken arm, which made travel extremely difficult. But more than that, I remember his demeanor and personality. 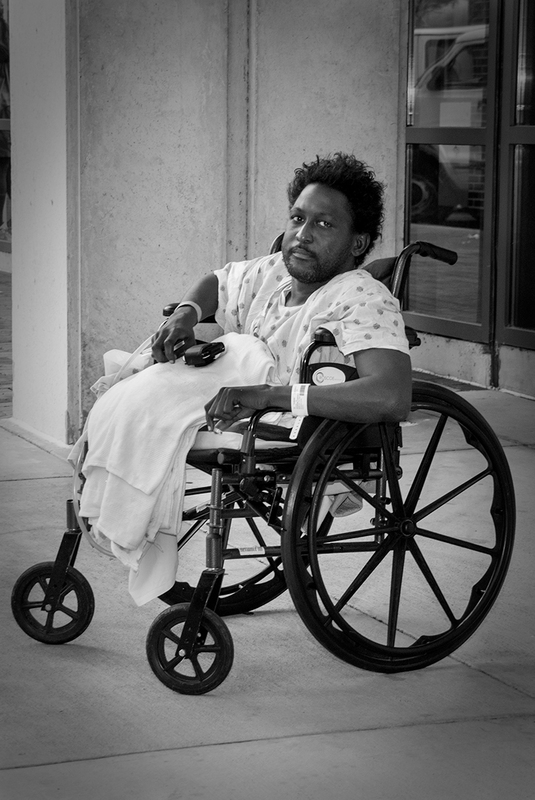 Many of the homeless I’ve met have an anxiousness to them. I can only imagine that comes from living in such difficult conditions. Mitchell on the other hand has a calmness about him, which in combination with his politeness makes him very easy to talk to. Mitchell’s cast was off, but he was walking with a make shift cane fashioned from a large stick he’d found. His arm was still swollen from the break, but the cast was missing. It must be difficult to care for a cast and keep it dry when you’re living outside. I nearly cried when Mitchell told me that he’d be in housing shortly. As we cleaned up and said goodbye to the last guests, Ron reminded the volunteers that we could eat as well. I love this for two reasons. One, the volunteers got up early and put in several hours. An offer of food is a nice gesture of appreciation. But more than that, eating the same food sends a message – we are tied together. We only share food that we ourselves would eat. Believe it or not, I have been places (prior to this month) where the soup kitchen manager turned her nose up at the food she bought, cooked, and served to the guests. 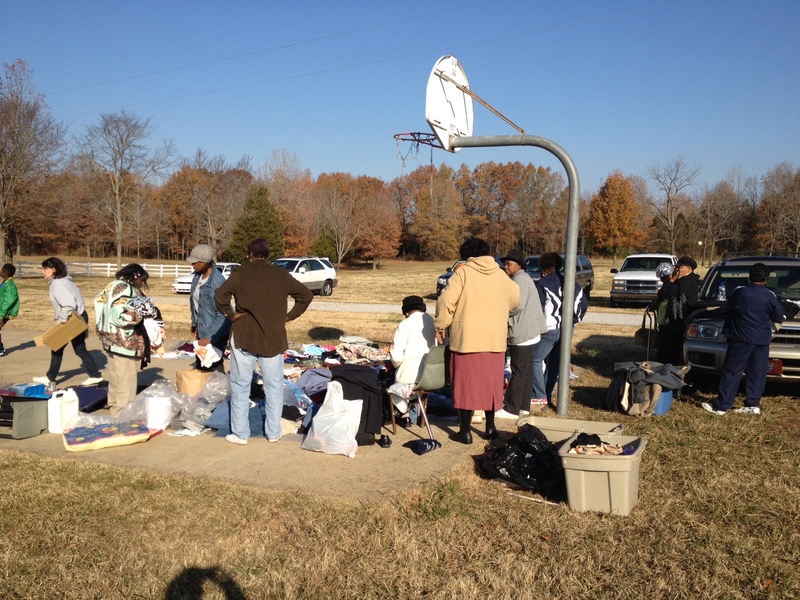 There were several families there to volunteer, taking advantage of the fact that their children were out of school. I had an opportunity to talk with the Kindred family, Anthony and Patrice and their kids Chavian and Peyton. Peyton is like a little ray of sunshine with pigtails and braces. She seemed to take in everything around her and jumped in to help when I went to scrub down the picnic tables. I asked her about the experience and what she thought. She said, “I feel like I’m helping and I feel like I should help because I have more than them.” Her brother Chavian had similar sentiments and when I asked if they would come back and help again, they both smiled and nodded. After the other volunteers left, I stayed to help clean the kitchen and marveled at how much I had learned about Ron over the last few hours. He deftly moved through the kitchen, whistling and humming as he finished prepping the fresh chicken stock. He reminded me to read the article about Kevin on the fridge. I obliged. If you haven’t seen it yet, you really should read it. When I read Ron’s story, I felt frozen for a minute. He’d been through so much. I looked over at Ron. What an amazing man. Everyone has a back story and usually we only get the surface level details. I felt fortunate that I had a chance to learn about Ron and to be part of Mitchell’s happy news. Another project comes full circle. Volunteer. The soup kitchen is open Monday through Saturday, but volunteers are especially needed Monday through Friday (Saturdays fill up far in advance). Donate. 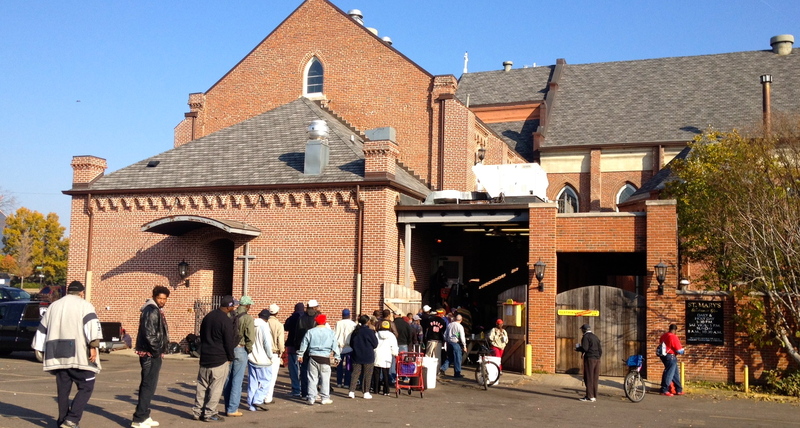 The soup kitchen runs on a tight budget and is at the mercy of what’s available in the Mid-South Food Bank. Donate funds. For just $40, Ron can feed 65 people! Donate paper products and coffee supplies. They are always in need of cups, napkins, sugar packets and bread. Donate Kroger gift cards. Whatever cannot be found at the food bank has to be bought at Kroger. Consider picking up a gift card for any amount next time you’re at the grocery story. To volunteer or donate, contact Ron Bezon ronbezon@yahoo.com or 901-527-5350. Are you a Turkey Person? When I was planning this project for November, I was surprised to find that Thanksgiving was one of the hardest days to fill. I know that people like to give back on Thanksgiving Day and I attributed my scheduling issues to this fact. It’s serendipitous that while I was planning 30 days of volunteering, I had the opportunity to hear an excellent keynote speaker. Bill Courtney deciding to take on coaching responsibilities for the Manassas High School football team. He took on a team who lost every game and turned them into one of the best football teams in the city. What makes this story even more incredible is that the story was turned into an Award-winning documentary called Undefeated. But it was not an easy road. If you volunteered today, that’s GREAT and I don’t want to diminish your efforts. Today is set aside to be grateful and to reflect on everything that we have. In our culture, we are typically showered with attention and presents on our birthday and many draw worth or sadness from the quantity of gifts and calls. But in some cultures, this tradition is actually reversed and you spend your birthday doing for others. I love this idea. The quickest way to appreciate your own life is to provide for someone less fortunate. There are many occasions to be thankful and compassionate throughout the rest of the year. Consider picking a special day for you – your birthday, anniversary, first day of summer – and turn that into a meaningful day of giving. It will enhance your special day and make a difference in someone else’s life. If everyone adopted this approach, we could cover each day of the year. Let’s give thanks today and every day. When I picked the name “Mission Memphis” for this project, I wanted to convey that you can make a difference in the world and do mission work without even leaving your community. I have never done this type of work in a different country, so my vision of this outreach is only what I have pieced together in my own mind: whole families living in small shacks, dirt floors, no electricity or running water. I understand that some people are looking for that experience and are willing to travel great distances for that type of work. Incredibly, those living conditions exist just 30 minutes from Memphis in Fayette County, Tennessee. Project Outreach is based at Our Lady of Perpetual Help Catholic Church in Germantown and they partner with the Church of God in Christ deep in Fayette County. I was glad to learn that several churches from different denominations in the Memphis area also support this project. I love to see that people of different beliefs can come together in order to help others and that spirit of cooperation is tangible with this group. My parents have been working with Project Outreach for years and on the drive this morning they explained the well-rehearsed drill. 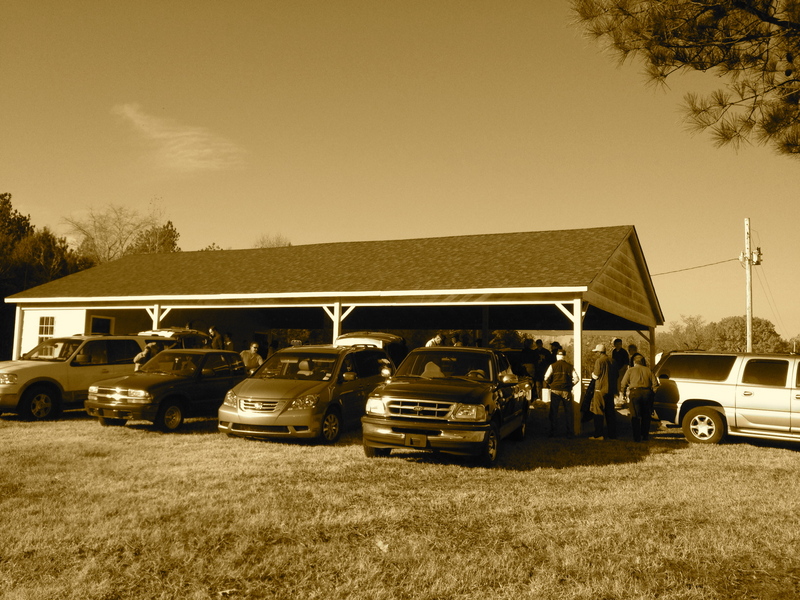 Everyone meets in a Collierville parking lot and you’ll see 15-20 cars loaded down with food and clothing. The group travels by caravan out the site – well, the group except for my Dad who makes it his mission to be first out of the parking lot! When we arrived we passed through the gates to the property and rumbled down the gravel road to the pavilion. The parade reached the pavilion and as if by silent cue, the drivers backed their cars to the opening. The car was barely in park when volunteers sprung from the pantry, instantly formed an assembly line and then whisked the bags into the back room. My parents have made many trips out to Fayette County and they’ve learned many things about the community and are well prepared for the trip. After unloading the cars, my mom reached into the front seat and handed me six roles of toilet paper. I looked at her dumbfounded. There are very small bathrooms on the property, but toilet paper is a luxury that’s hard to come by. Our first order of business was stocking the tiny bathrooms, which had been meticulously cleaned by several of the ladies in the community. Walking back from the bathrooms, we stopped to help sort the donated clothing, which was being carefully displayed on tarps covering half of the makeshift basketball court. The other half of the court was firmly claimed for its intended purpose. There were a handful of people sorting, while quite a few residents waited quietly around the perimeter for the opportunity to pick through the piles. Over the years my parents have built relationships with several residents in the community and I was looking forward to meeting them. “You have to meet Connell” my mom said. “He’s always here early to help.” This picture doesn’t do him justice. When my dad walked over to him, Connell lit up like a kid a Christmas and he had that look of joy on his face the rest of the morning. I can see why my parents like him so much. He’s kind, hard working, and he laughs at my dad’s jokes. 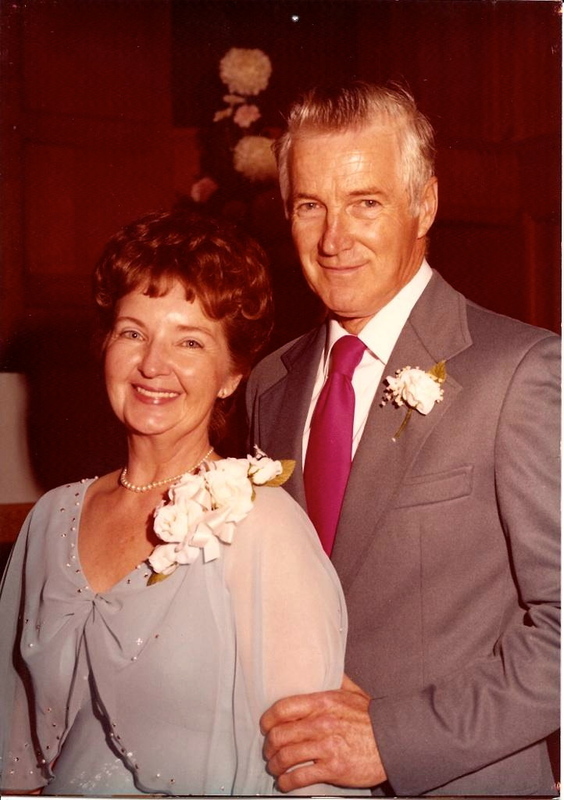 My mom and dad had described Rice Smith – a large man with a kind heart, one lung, and a spirit for hard work. I’d heard them talk about Rice before. They donated my sister’s car to him several years ago and he used it to shuttle others to and from their doctors appointments. Unfortunately, I didn’t get the opportunity to meet this incredible man. The life of a rural poverty in Fayette County takes a toll on people and this morning we learned that Rice died yesterday. Connell didn’t want to talk about it. As the crowd began to grown, I studied the people gathered together. There was an older lady with a weathered face, very thin arms and a golden turban. I wish I had a picture of her. I noticed that she was shivering. It wasn’t as cold as usual, but she was so small that a strong breeze could have carried her away. I wondered why she didn’t move to a nearby car for warmth and realized that she and everyone else were perched – waiting to make sure they secured a spot in the line. When I looked back a few minutes later, she was wearing an oversized coat and the man next to her now he had arms wrapped tightly across his chest. 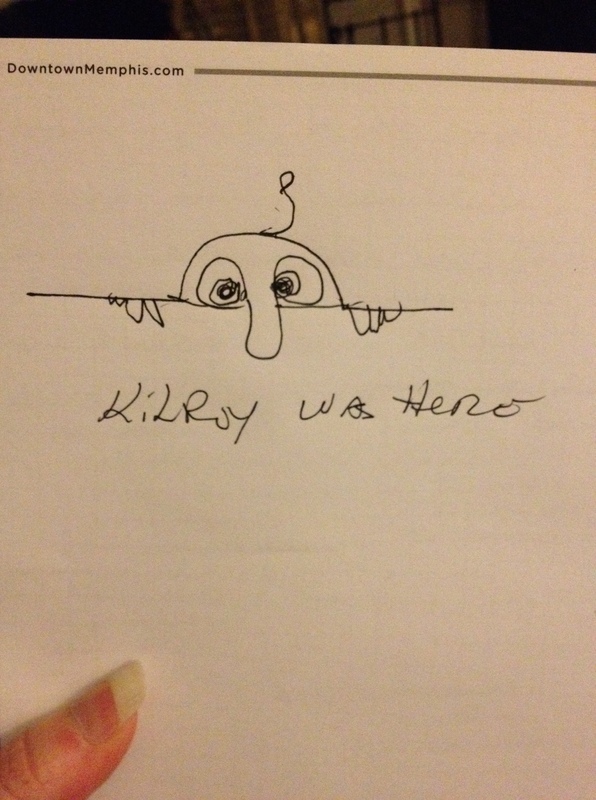 I peeked into the back pantry. It was bare when we arrived and within 45 minutes, it was stocked to the brim with more food at the ready in the parking lot. In the center of the pavilion, tables sprung up from nowhere and as if by magic were filled with fresh food – pears, apples, sweet potatoes and tomatoes. Each family would leave with a bag of canned goods, a sack of produce and a Thanksgiving turkey. Our neighboring county has been listed as the third poorest county in the entire nation and many will never leave the few miles around their homes. 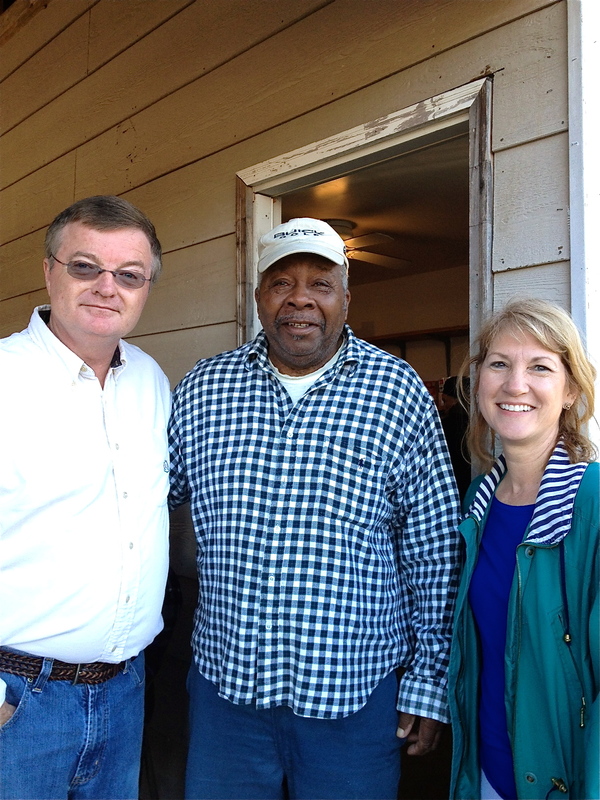 Today, I had an opportunity to learn about rural poverty and meet the families in need. After several hours, the food and clothing were distributed and we went to say goodbye to Connell. When my mom and I found him, he asked if we would be back next month to help with the Christmas distribution. My dad was really disappointed that he wouldn’t be able to make it next month, but Connell seemed most upset by this news. I put my hand on Connell’s should and said, “Don’t worry – I’ll be here next month and I have my Dad’s terrible sense of humor.” Connell roared with laughter and hugged me. As we drove the gravel road back to the gate and out of the gate I looked out the window and then asked my mom to double back. I realized that either side of the entrance had a statue of Jesus with His arms outstretched. 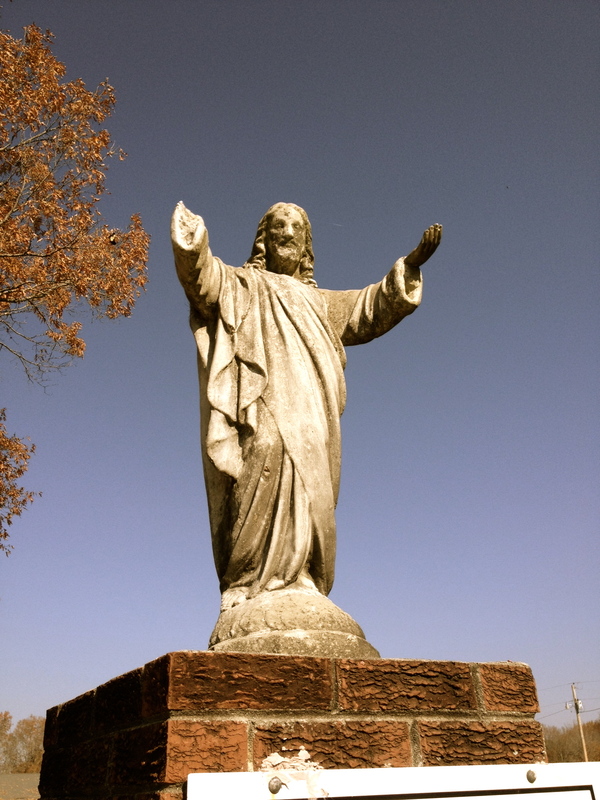 We pulled up, I looked more closely and realized that one of the statues was broken – Jesus was missing his right hand. I said “I guess I’ll take a picture of the other one.” I went to the gate and walked toward the intact statue. But then I turned and looked at the broken one. Many of the people who come through these gates are hardened and broken down by a hard life, but all are welcome here. Today, everyone received kindness and hope regardless of the exterior. I knelt and took a picture of the beautiful broken statue. The most helpful thing you can do for Project Outreach right now is to donate. You can make a monetary contribution or you can give food and clothing. Fresh produce seems to be especially needed. The project is currently well-staffed by parishioners from the supporting churches, but sometimes there are open spots for new volunteers. For more information on supporting Project Outreach or other initiatives to help those in Fayette County, contact Shona Moore at highc1333@aol.com. I wish you could meet my grandparents. They are some of the most incredible people I have ever known. They built their house themselves and even rebuilt it after it caught fire. Every detail of their home was carefully planned out: my Grandpa Bob’s workshop was meticulous and my Grandma Ginny put a large wall mirror in the middle of the living room. My Dad grew up in that house and we spent a lot of time there as kids. My Grandma Ginny is in her 80s but you’d never know it! She has a diet and exercise routine that puts me to shame: baked chicken and steamed broccoli, water aerobics 3 days a week and last year she did the “Miracle Mile” in St Louis – a one mile race for seniors. She sends me pictures and text messages from her iPhone (when she can find the time). She’s incredibly smart, bright and loving. Even when I was a kid I remember thinking how clever she was and how much cooler she was than everyone else’s grandma. My Grandpa Bob has always been the guy you call when you need something. Broken water heater? No problem. Roof to replace? On it. Something to build? Even better. A day sitting still was a day wasted. I have always thought that my grandpa could do just about anything. He has always jumped at the chance to do something for others, especially when they weren’t able to do it for themselves. Once when I was in high school, I was so sick that I could hardly move and my 75 year old grandfather carried me up the stairs. When I was young we moved away from St Louis and only got to visit once or twice a year. My brother and sister and I would clamor out of the car, scramble over one another, and race into the house for big hugs. My mom used to apologize to my grandmother because we would put our hands all over the giant mirror in their front room. I later learned that my grandmother would intentionally clean around the handprints so she could look at them until our next visit. Each time we left, my grandparents would come out the driveway and wave goodbye until we were out of sight. 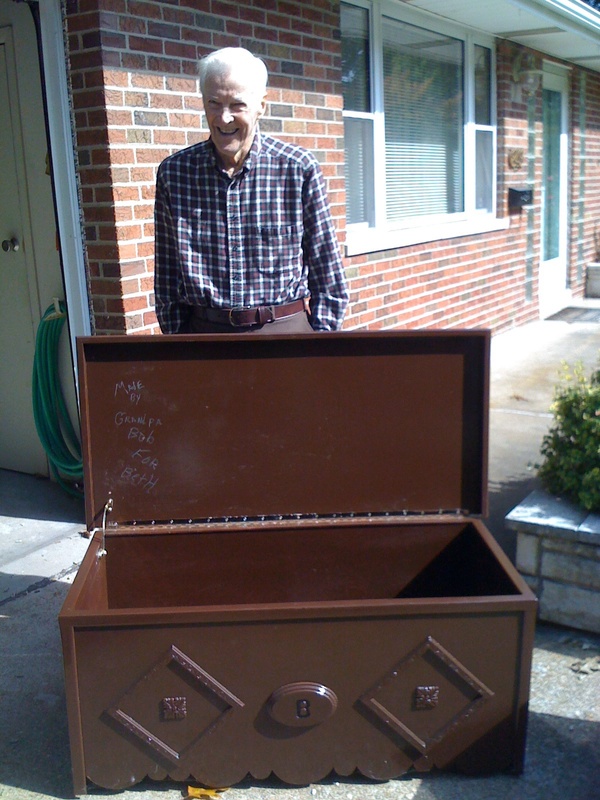 A couple years ago, my grandfather built hope chests for my sister and me. I asked him to sign the inside, which he initially protested saying, “What would you want me to do that for?” With help from Grandma and my parents, he finally signed the lids and event consented to a picture on the driveway. Three years ago, I took this picture of my Grandma Bob on the driveway. And three years ago, I saw my grandparents wave goodbye from the driveway for the last time. Shortly after that visit, my grandfather had stroke. One of the strongest men I’ve ever known was suddenly in need of help and care. In short, my grandparents were no longer able to stay in the home that they built because the demands of his care and keeping up with the house were ultimately too much. I tell you this because you’ll need this back story in order to understand the full range of emotions I felt on my last volunteer experience. When I initially talked with Meritan about including them in my project, I didn’t realize how much it would make me think about my grandparents. While they offer many programs and services, one of their main focuses is helping seniors stay in their homes for as long as possible. When I arrived at the Meritan headquarters on Monday morning, I was blown away to see that Lee Warren had gone out of his way to make me feel welcome! Of their many programs, I volunteered with Silver Bells, which is an opportunity to adopt a senior for Christmas. I select silver bells for a married couple named Cathy and Dale, but when I looked at the bells, I was surprised to see that the very short list included cleaning supplies. As I looked at the tree, I noticed that most bells had similar requests – cleaning supplies, paper towels, and lightbulbs topped the list. This surprised me a little bit, so I asked Sheila Williams and Elise Bone at Meritan these gift lists. They explained that the seniors they serve are low income on very tight budgets and they have to decide each month how they will spend their limited funds. Sometimes the decision comes down to electricity or cleaning supplies. Which would you choose? This realized made me feel sad, grateful, and motivated all at the same time. I picked several items off the list and then we went to deliver them. 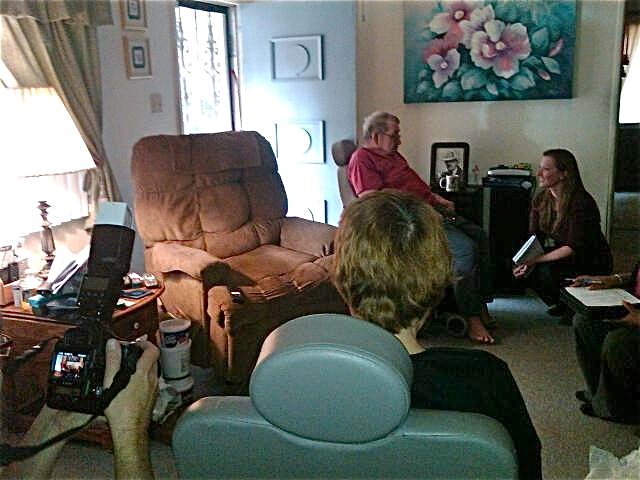 When we pulled up to the house, Dale was waiting outside in his wheelchair and had clearly been waiting for company. As I walked up the ramp Dale yelled, “What are you doing here? Dinner’s not ready yet!” His wife Cathy laughed from inside the house as he led us into their home. 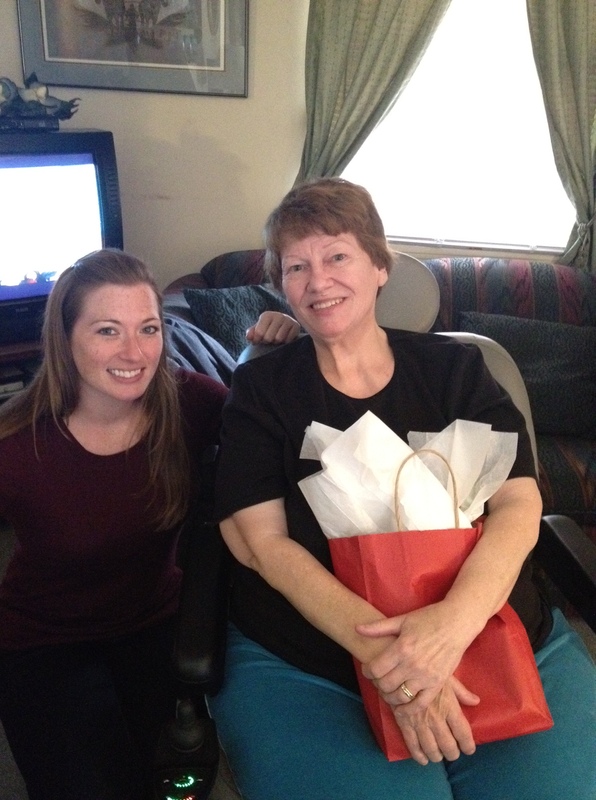 They were both thrilled to have company and told stories about their kids, grandkids, and how they met. I told them about my family and my Grandma Ginny and Grandpa Bob. After many stories and several hugs it was time to leave. At one point Cathy took both of my hands in hers, which caught me off guard. She looked at me very intently and told me how much she loved my project about volunteering. I smiled and nodded politely, which was apparently insufficient! Cathy pumped my hands up and down for emphasis and told me again how important it was to volunteer and how much she enjoyed talking with me. I gave her a big hug. Dale and Cathy followed us to the door and then out onto the front porch. Walking to my car, I realized that I was sad to leave. I sat in my car for a minute as the others drove away. As I turned to leave and as I drove off, I looked back at the house to reflect on my visit. As I left, I realized that Dale was waving goodbye from the driveway. The tears came instantly. If you are lucky enough to have wonderful grandparents in your life, go hug them right now! 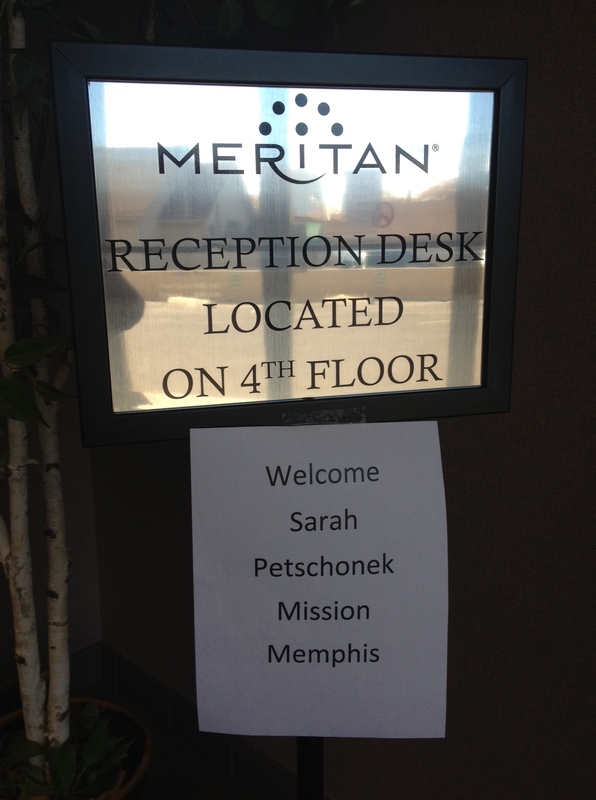 There are many ways to help Meritan ensure that Memphis area seniors can stay in their homes. Volunteer. You can sign up as a Homemaker, where you assist with daily living activities like light housekeeping and trips to the grocery store. There are other volunteer opportunities on a case by case basis. For the most up to date information, check their Facebook page. Adopt a Silver Bell. Contact Sheila Williams sheilawilliams@meritan.org or 901-766-0623 to adopt a senior or make a donation to this wonderful program. Donate. Every little bit helps. Ask about how little it would cost to supply a senior with cleaning supplies for a full year. When you picture the people who live in a shelter, this is probably not the sweet little face that comes to mind. 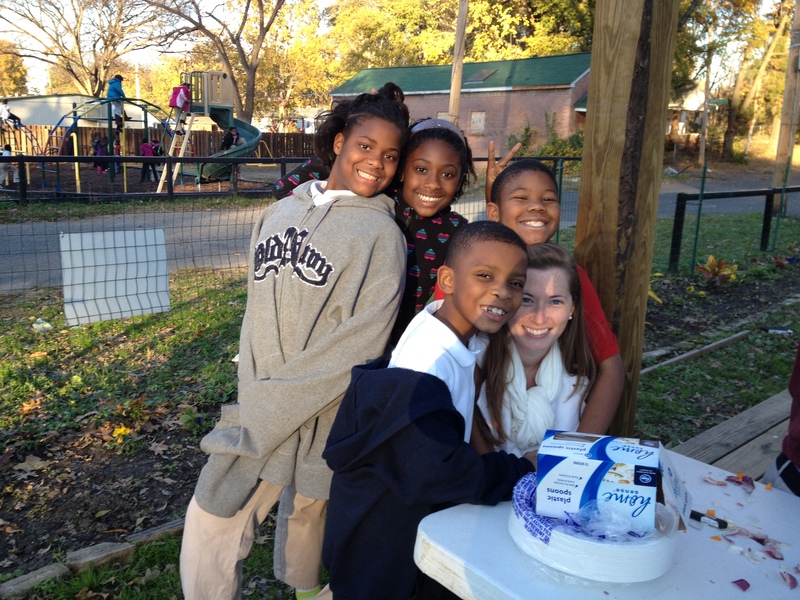 The Dorothy Day House of Hospitality is the only shelter in Memphis that accepts families. Most shelters only take women with female children or they accept single men. If a single mom and her 16 year old lose their home, it will be nearly impossible for them to find a shelter that will keep their family intact. If a young couple and their infant fall on hard times, they will have to split up to find shelter. At a time when family is everything, many families are torn in different directions just so they have roofs over their heads. Before my visit I worried about how the families would react to a stranger in their home. They were already on hard times and feeling exposed. Three families live in the house together and I’m sure that they long for privacy and their own space. Would they really want me intruding on their Sunday evening? I wanted to do something fun with the kids so I went for something we did around the holidays when I was younger. I recruited Courtney Ratts, Lauren Perry and Trish Kalbas-Schmidt to decorate cookies with the kids! We brought sugar cookies, sprinkles, frosting, and candy. Courtney gifted homemade gingerbread cookies even though she couldn’t come that night. When we got there we learned that the kids had talked about gingerbread men at school and they were thrilled to see the real thing. We ran out of those first! We had about six kids decorating cookies and about nine of us covered in frosting. These kids are amazing! They are polite, creative, curious and enthusiastic. They warmed up to us right away and I was amazed how easily they shared with one another. “Hey can I use your blue frosting?” was always met with “Sure!” Our biggest error of the evening was cookie inventory control. In other words, I think some kids wolfed down five or six cookies before we realized it! One of the girls meticulously counted the cookies. I asked her how many there were and she said, “Let me double check” and she counted again. “68!” she told me. 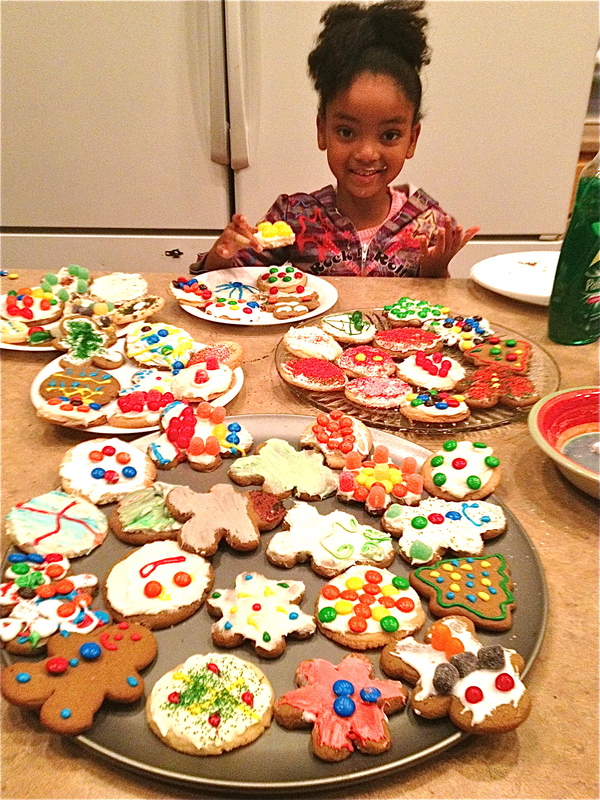 Her cookies were beautifully decorated. I guess she’ll either be an artist or an accountant. Now that they’d decorated more than six dozen cookies (and eaten a dozen more), Lauren clearly stole the show when she brought out her magic bag of children’s books. You can tell Lauren loves kids. Her teacher side came out and she read each story with so much enthusiasm that the kids crowded around her. She even had a special voice for each character. Whether she knew it or not, even the adults stopped to listen. 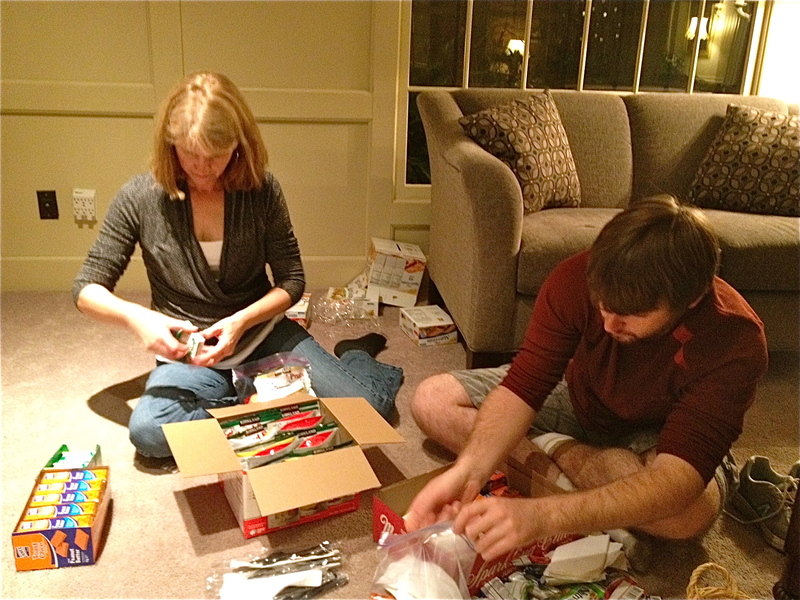 We originally thought that we were just coming to spend time with the kids and bring a little fun into the house. I realized two things. This house is already happy. It’s nothing like how you imagine a shelter. It truly feels like you’re visiting someone in their home. The kids are the life of the house and it spreads to everyone else. And only later did I realize that while we came for the kids, the parents got something too. It must be exhausting to worry about everything all the time, while still being strong for your children even when you’re scared and sad and tired. I hope that just for a few minutes they were able to sit down, take a deep breath, and watch as their kids laughed and played. After cookie decorating and storytelling, everyone gathered in the front room for prayer. Whether you’re religious or not, you’ll feel welcome. The group says a few simple prayers and then asks if anyone would like to say something that they’re thankful for. The kids jumped in right away. I was touched by their thoughtful answers as they said thanks for many of the things that we take for granted everyday. “A roof over our heads” one child said. “My family” said another. And the list goes on. Warm clothes. Volunteers (that made me smile). God’s grace. Cookies! And second chances. Pause. Second chances. I heard an eight year old girl thank God for second chances. It makes you wonder how much she’s seen in her young life and what the future holds for her. As we were packing up to leave, one of the little girls looked up and me hopefully and asked if we would be coming back tomorrow. I told her that we couldn’t. She pouted so instantly that the effect was comical. I laughed and cringed at the same time. I told her that we couldn’t come tomorrow but that we wanted to come back and see her again soon. She looked at the table full of cookies and nodded. I’d say our cookie mission was a success in more ways than one: the kids had fun and the parents got a small break as well. As the three of us walked out the back door and filed down the steps, I think we all felt a little sad about leaving and a little more grateful for our families and our homes. We went with the intent of giving, but we left with much more than we gave. Volunteer! There are so many ways to give your time at the Dorothy Day House. You can plan an event like we did. You can bring or make dinner for the families. Anything you would need in your own home is needed – yard work, cleaning, maintenance, etc. Call (901) 725-2714 or visit their volunteer page for more information. 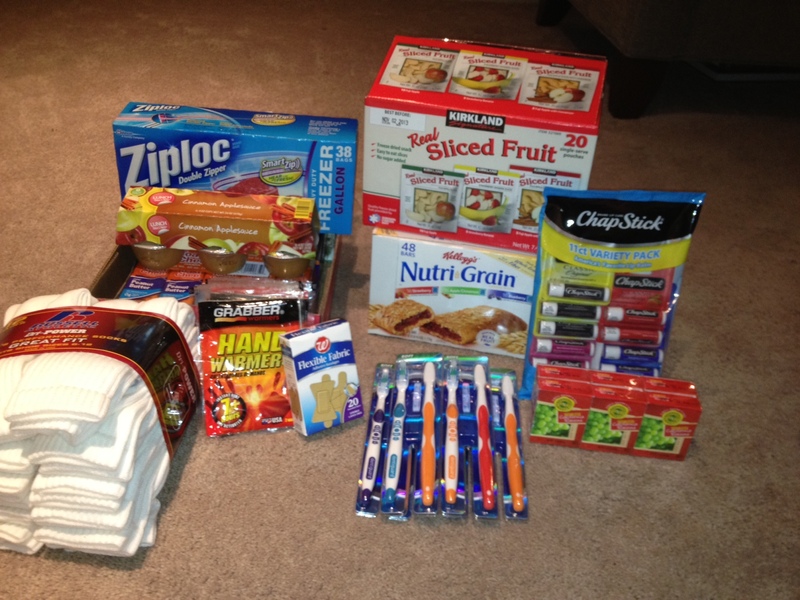 Give something small from their list of needs like toilet paper, gift cards to Kroger, and trash bags. Give something BIG from their wish list. For example, their narrow driveway is becoming increasingly hazardous because of a large tree. Do you know of a tree removal company who might donate their services? Make a monetary donation. Every little bit helps! Contact the wonderful Sister Maureen mgriner@aol.com to get involved! For me, this has been the week of South Memphis. My adventure with GrowMemphis took me to the corner of Douglass and Hamilton, which is firmly in Orange Mound. I have never intentionally been to Orange Mound except to pass through and I most certainly have never gotten out of my car. Prior to the event, I talked with their Volunteer Coordinator, Zoe Chertov and always appreciated how quickly she got back to me. She said we’d be working in a group at the site and not to worry! I’ve got to admit, I was a nervous on my drive there – I passed a lot of dilapidated buildings and felt like everyone was starring at me on my way through. But sometimes the fear of the unknown is only what scares you. 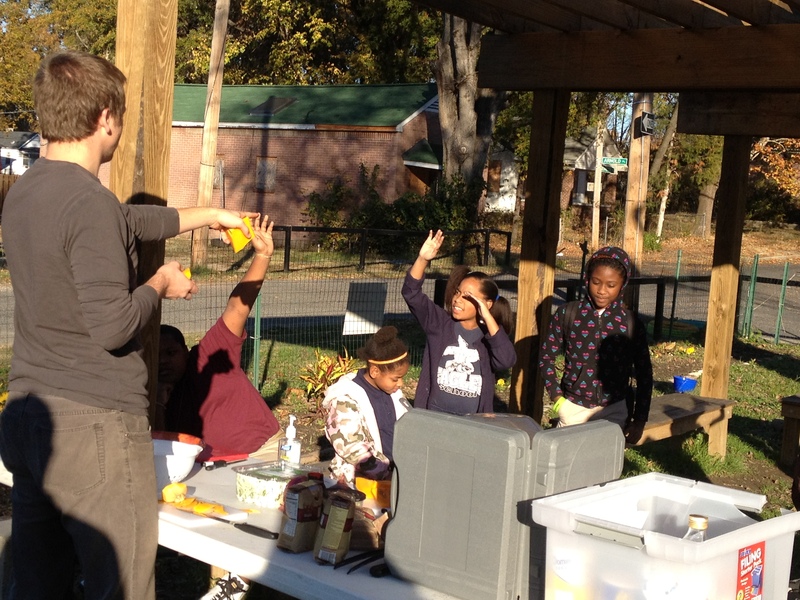 That nervousness eased when I got to the garden and saw several volunteers at work in the garden with the GrowMemphis team. 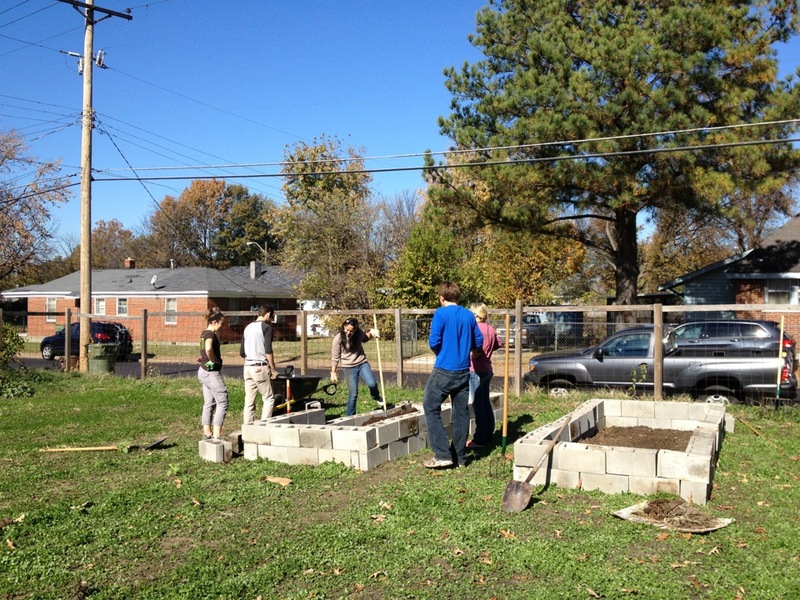 We spruced up the compost bins and used the fresh soil to fill the new raised flowed beds constructed along the fence. While we were working I talked with Director Chis Peterson about the role of GrowMemphis and why their work is important. He talked about the problem of food deserts – those areas where grocery stores are sparse and produce is hard to come by. He also told me that there are now more people in the world who are obese and malnourished than malnourished and emaciated. 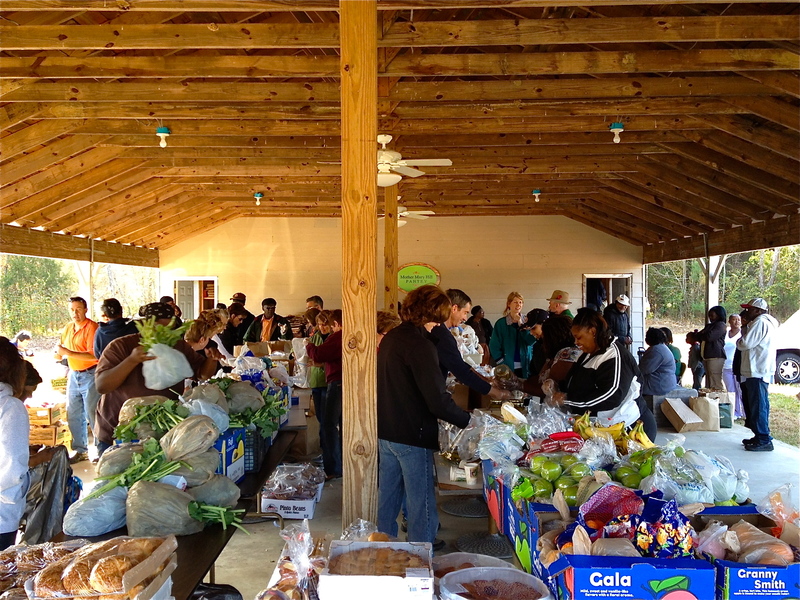 One of their goals is to provide access to healthy food like tomatoes, strawberries, herbs so that those in the community have pick fresh fruits and vegetables in the garden. They’re also trying to encourage community cooperation and revitalization. The idea is that by taking over a blighted lot and turning it into a garden that they will encourage others in the neighborhood to care more carefully and take more pride in their own property. In theory, this approach creates a type of domino effect. As if on cue, three kids from the neighborhood showed up to help. The older brother, Mike was 9 and loved poking holes in the cardboard lining the flower beds. His young sister took pride in showing off her strength and actually helped us move cinder blocks and build the bed walls. Their youngest sister (about 2) was more likely the smiley mascot and was mostly just content to spin around in circles and entertain us as we worked. I looked around the neighborhood and noticed that there seemed to be a lot of stray dogs. I’ve always heard that there are problems with stray animals, but honestly, you rarely see them in the “nice” parts of town. I glanced further down the street and noticed that there were some teenagers talking loudly and shoving one another. I found myself wondering about the three children working in the garden with us and would they would be doing if we weren’t there. What is a typical day in that neighborhood for them? As the morning warmed up, the foot traffic along the end of the garden increased too. Some people ignored us and some watched closely while we working. 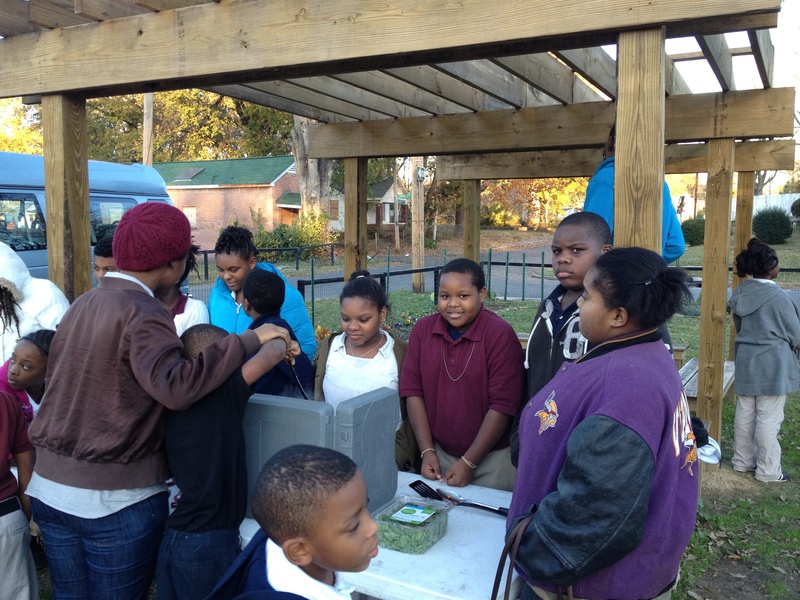 There was one other person who came to the garden and spoke with the GrowMemphis team for a few minutes. It was clear that the neighborhood was taking an interest in the project. If you like gardening, the outdoors or community building, this is a great opportunity for you. 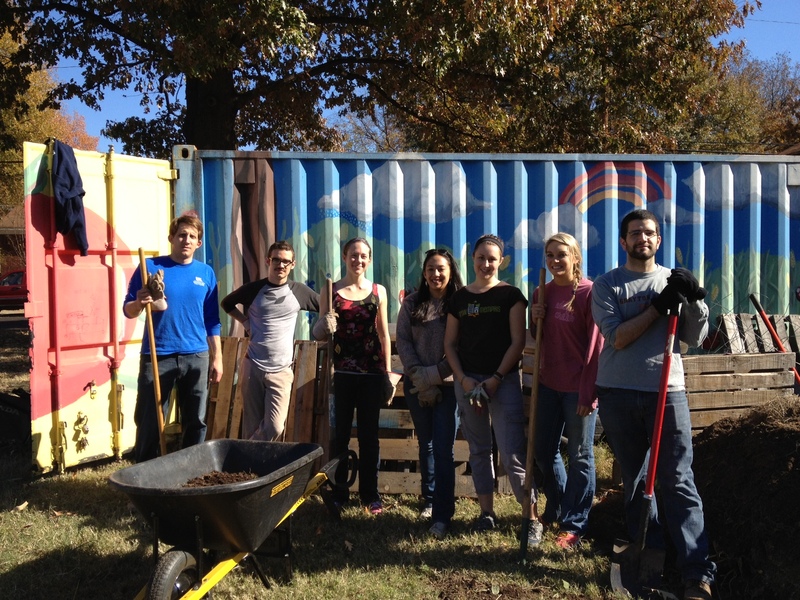 The GrowMemphis team is friendly and enthusiastic and they draw talented and enthusiastic volunteers. While there, I met Hayley Milliman and Elaine Fath – both in Memphis thanks to Teach for America. I asked how they were liking Memphis and both described a sense of growing momentum. Hayley even told me that Memphis moved to the top of her list of places to return after her time with Teach for America. After a couple hours, I ducked out just before the bid delivery of manure was to arrive (have to save something for next time!). I’m looking forward to checking in on the garden and the neighborhood to see how the presence of a fresh fruits and vegetables impacts the community over time. Volunteer! Contact Chris Peterson chris@growmemphis.org to learn more about the short term and long-going volunteer opportunities with GrowMemphis. Donate! GrowMemphis is a 501(c)3 and has multiple suggested donors levels. If a picture’s worth a thousand words, a visit is worth a thousand pictures. I took more pictures at Knowledge Quest than anywhere else, but they cannot possibly do justice to this incredible, amazing place. I loved this group – the team, the facility, the kids! As I was leaving, I confessed to the Knowledge Quest team that I was terrified by my responsibility to describe this place in words. I’ll do my best, but really – you have to go see it for yourself. I can count on one hand the number of times I have intentionally been to South Memphis. This place has a stigma to it. Growing up here, there are some areas that you’re warned to stay away from and South Memphis has been firmly on that list. Knowledge Quest Director Marlon Foster says that in the past, “South Memphis ranked #1 in all the wrong things.” Many people believe that only crime and heartache come from anything south of Crump Boulevard, but as I learned, that is not true. I can confidently tell you that Knowledge Quest is not only one of the best things in South Memphis, but also a shining beacon that all of Memphis should celebrate. If this is the first time you’re hearing of Marlon Foster, it won’t be the last. Marlon is easily one of the most genuine, charismatic, inspiring people I have ever met. 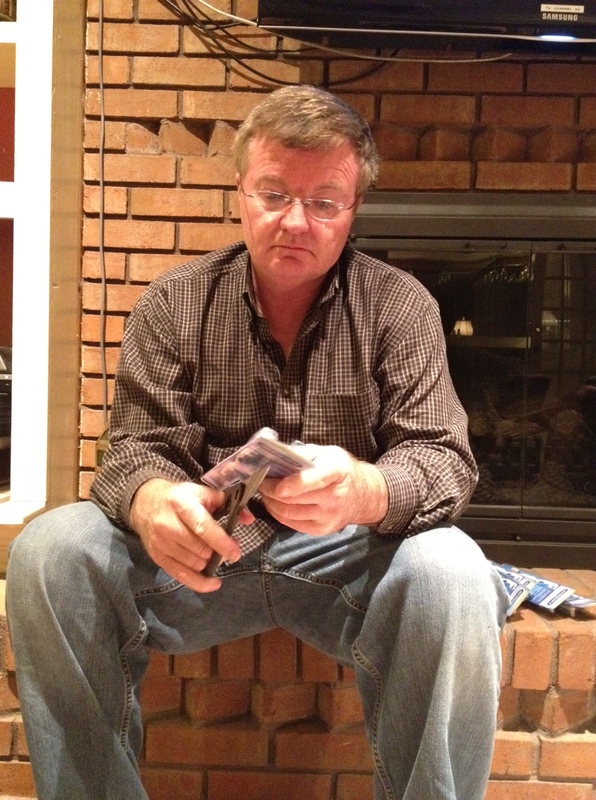 I could listen to this man talk for hours and it’s easy to see why the kids flock to him. After just 5 minutes with Marlon, I felt like I could go save the entire world. He was born and raised in South Memphis and as a teenager, Marlon’s best friend was killed in their neighborhood. Marlon made the decision to honor his friend by turning his death into a motivator: he was the only one of his friends to graduate high school and certainly the only one to attend college. After college, he stayed in South Memphis to give back and to give the kids a chance to learn, grow and succeed while keeping them off the streets. As we walked outside, Marlon pointed to their street and said their goal is for you to be able to do a 360 and see that they want to transform the whole neighborhood – not just their own property. They’ve been cutting grass and caring for empty lots around them and it encouraged their neighbors to take more pride in their own homes. The lot across the street had been turned into their Green Leaf Learning Farm and that’s where I spent the rest of the afternoon. Green Leaf Learning Farm at Knowledge Quest. Christian Man and students making healthy pasta. Christian Man was in the middle of a cooking lesson for grade school students in their outdoor classroom. “Mister Christian” as they call him was teaching the class to make pasta and was talking with them about acorn squash, arugula and pine nuts (truly in line with the healthy eating emphasis at Knowledge Quest). I snapped a few pictures from the side and marveled at how the students were so engaged and enthusiastic. Even when Christian asked for a volunteer to take the squash seeds to the compost bin, five little hands shot into the air. As I walked over to join the group, I hesitated. I realized that I was experiencing an odd mix of emotions. 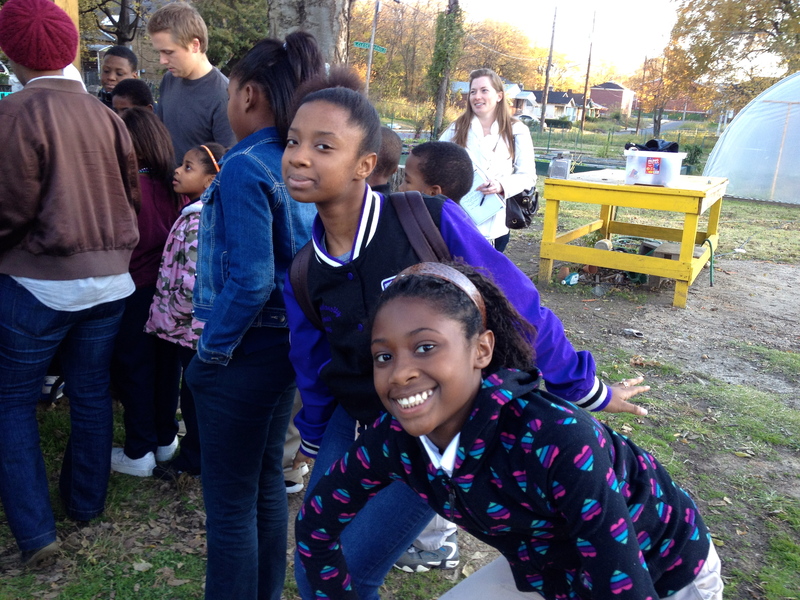 First, I felt ridiculous for wearing a white peacoat to an outdoor cooking project with kids. I felt overdressed, impractical, and out of touch. But more salient than that, I also felt awkward and unsure of myself. I was surprised to realize that I was worrying about whether or not the kids would accept me or if they would just see me as an outsider invading their safe haven. It occurred to me that these kids probably worry all the time about fitting in. I think most adults still worry about being accepted and included by others and it holds us back from pursuing our true potential. I decided that if the kids had the courage to come put themselves on the line, that I could do it too, but it took me a little while to get comfortable – not because of the kids, but because of myself. While this vaguely occurred to me at the time, it really hit me when I looked at the pictures. One of the students, Jailon, was really excited about taking pictures for me and caught me in one of these awkward moments standing off by myself. I actually almost deleted this picture because my first reaction was that it didn’t show me as the engaged volunteer that I wanted to portray, but I realized that if this resonates with me, that hopefully it will resonate with you. After I few minutes I got my act together and started talking to some of the kids. Kids are just like adults in most ways – they want to belong, to feel important and to feel good at something. People sometimes ask me whether you can compliment someone too often. I whole heartedly believe that if you offer someone a genuine compliment, it’s always welcome. Kids are especially receptive to that type of feedback. For example, Jailon told me that he really liked photography so I handed him my phone and watched as he took such pride and ownership in his work. Most of the pictures I’m posting today are because of him! Once I remembered this simple approach – asking questions about their interests and praising their hard work during the cooking lesson, they warmed up right away. I simply sat down next to one of the students and asked if he would take a picture with me. 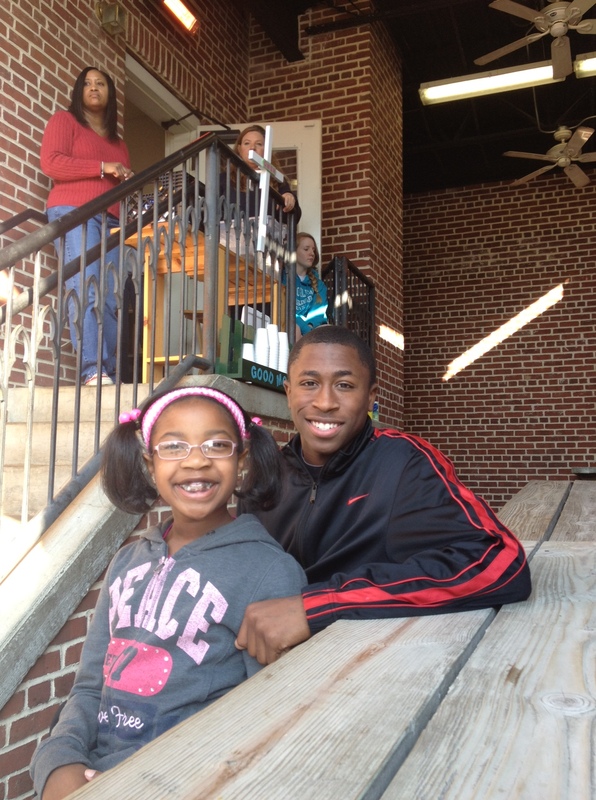 He wrapped his arms around me and three other kids jumped in, while Jailon snapped this awesome picture. I went from being on the outside to being right in the middle. While talking with Jailon, I remembered what Marlon told me about the students – they come here by choice and choose to spend their time here. So I asked Jailon why he comes everyday. He said “because it’s fun, I learn new stuff and I get help with my homework. It makes me feel good.” When I asked what he would be doing if he hadn’t come he said he’d do some homework and then play video games. Jailon ran back to join the cooking demo and I started scanning through his pictures and realized they were great! Definitely better than mine. I yelled across the table so all the kids could hear, “Jailon! These are awesome!” and he just beamed at me. I always rate my volunteers experiences on an informal scale ranging from “How soon can I get out of here?” to “How soon can I come back?” The time flew by and the setting sun was the only thing that clued me in to how long I’d been at Knowledge Quest. I can’t wait to go back and I hope you’ll come with me! You can have teach an ongoing course like cooking or chemistry or creative writing (endless options). You could do a one day workshop! What’s your interest? Singing, painting, science experiments, art? Whatever you love, here’s your opportunity to give the kids an opportunity to love it too. You don’t have to be an expert – for example, chefs are very welcome, but enthusiastic home cooks are welcome too! Help tutor! The kids seemed really receptive and grateful for the help. If you can commit to one day a week for at least 6 weeks, this would be perfect. If you could come Monday – Friday even better! Skilled workers are needed to help finalize the Knowledge Quest Kid Zone. If you’re an electrician, plumber, HVAC technician, etc. your time would be greatly appreciated. Knowledge Quest currently has a waiting list and the faster they can expand, the more kids they can help. Speed bumps or other traffic calming measures in front of Knowledge Quest. A cut through street divides the Knowledge Quest building from the Learning Farm. I saw several cars fly down this street past the kids. A total re-branding and marketing campaign. Marlon said they have many ideas and need some help revitalizing their image to match the way they’re revitalizing the community. An 8th raised garden bed. A great half day project for a group. If you let them know in advance, the kids will show up too! Contact the wonderful Marlon Foster mfoster@kqmemphis.org to get started. Imagine you have lost everything and try to think of what that might look like. You have lost your job, your home, your car and you’re on the streets. But you’d still have something that millions of people dream of. You are a citizen of the United States. This week at the DeNeuville Learning Center, I met five amazing women who have that dream and are working to make it a reality. They left their homes and families for the chance at a better life. These women legally immigrated to the US and are hard at work learning English and studying to take their citizenship test. DeNeuville’s goal is to “assist women of all backgrounds and cultures in learning the skills needed to make positive choices for themselves and their families.” I first learned of DeNeuville at a Give 365 event and had the chance to talk with their Executive Director, Sister Lakshmie Napagoda. When I visited this week, she was proud to tell me that their worthy programs received maximum funding from this community-based grants program. From what I saw, it’s definitely being put to good use. When I first talked to Maria Ruiz about volunteering with her class, I noticed her beautiful accent and learned that she also immigrated to the U.S. and moved here from the Dominican Republic more than 20 years ago. I told her that I would love to volunteer, but confessed that I wasn’t sure how much I could help – I don’t know anything about the immigration process and I’m not bilingual. She said “you’re a native English speaker. That’s a big help to us!” On top of being a native English speaker, I tend to have very little “accent” at all – having been raised by parents from the Mid-west, my pronunciation tends to be crisp. I always just thought that was a lack of flair, but in this case it was a bonus. I had never considered that my lack of accent would be so valuable, but I realized that when you are trying to learn English, it’s tremendously helpful to learn it from a native English speaker. I would guess that makes you (my reader) a good candidate to volunteer at DeNeuville! Earlier I mentioned the five women I met this week and I want to tell you about them. Kadija is from Sierra Leone, which is a small country in West Africa. In her country she didn’t have the chance to go to school or receive any formal education, so it’s amazing to watch as she carefully masters the English language. I met a woman named Laura from Mexico and she helped me understand the correct pronunciation: La-oo-ra. I learned that our pronunciation of Laura actually sounds like the Spanish word for parrot (loro) and she very politely explained that she’d rather not be called a parrot. Who could blame her? Aziza is from Ethiopia and shortened her name from Aziizzaa in order to make her transition easier. From her I learned that many Ethiopians speak Oromo and the Oromo alphabet has many similarities to English. Beatriz is from Mexico and was one of the quieter ones in the group. I learned that she has very little opportunity to practice her English – most of her opportunity to practice is with her daughter, but she rarely has the opportunity to talk to adults in English. Lizeth is also from Mexico and it’s clear that she is very determined to learn English. Most of the other women had been in the US for more than 10 years. Lizeth has only been here for two years and she is a quick learner. Each time I said a new word, I could see that she was carefully repeating it to herself and taking advantage of the rare opportunity to practice with a native English speaker. Maria Ruiz was so encouraging and has done a wonderful job of creating a safe learning environment. When I was in school, I think my least favorite phrase to hear was “Sarah, come to the board.” Ugh! But in this class, the students quickly rose from their chairs to seize the chance to practice and improve. I was inspired by their determination and dedication to achieve something that most of us take for granted. During the break, I told Maria that I had never mastered another language and she reminded me that it’s much easier to learn a new language when you’re immersed it in. Between that and what Beatriz said earlier about only practicing English with her daughter, that made me wonder: how often do these women get a chance to practice English? They can and do take advantage of the classes at DeNeuville – structured courses (meaning workbooks and lessons) focused on learning English and studying for the GED. When class resume, I asked whether they could practice English at home and they all slowly shook their heads no. I started to realize how isolated their communities are from the general population of Memphis. I was shocked to realize that in their neighborhoods there were no native English speakers and that it was difficult to find opportunities to learn the language of their new country. Simply curious, I asked another question: would you like to meet up here in the evenings just to talk and practice English? They looked at me wide-eyed for what felt like an eternity. Had I said something offensive? Was there a cultural norm I had violated? I realized that they were just stunned by the offer. “We would love that” they told me. Volunteer 4 minutes of your time right now and watch their video. Teach a class. 75% of the teachers are volunteers and their teachers are critical! This is an ongoing commitment, but very rewarding! You’d be surprised how much you have to contribute! Check out their incredible list of classes. Babysit. 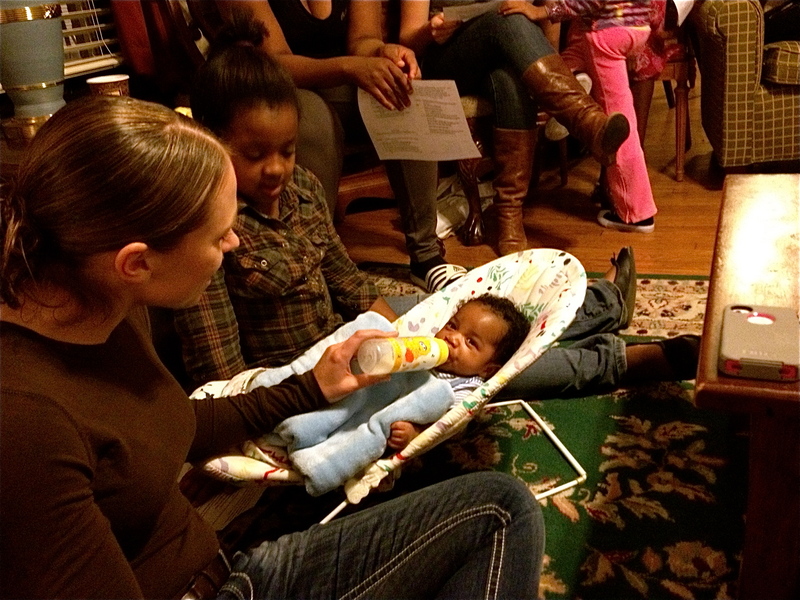 DeNeuville offers babysitting services because many of their students have children and DeNeuville wants to make sure that it’s easy to students to come to class without worrying about finding childcare. Work in the office or at the front desk. This can be an ongoing commitment or you can fill in for their full time staff as needed. Help with grants and fundraising. I know Sister Lakshmie would love to have your help! 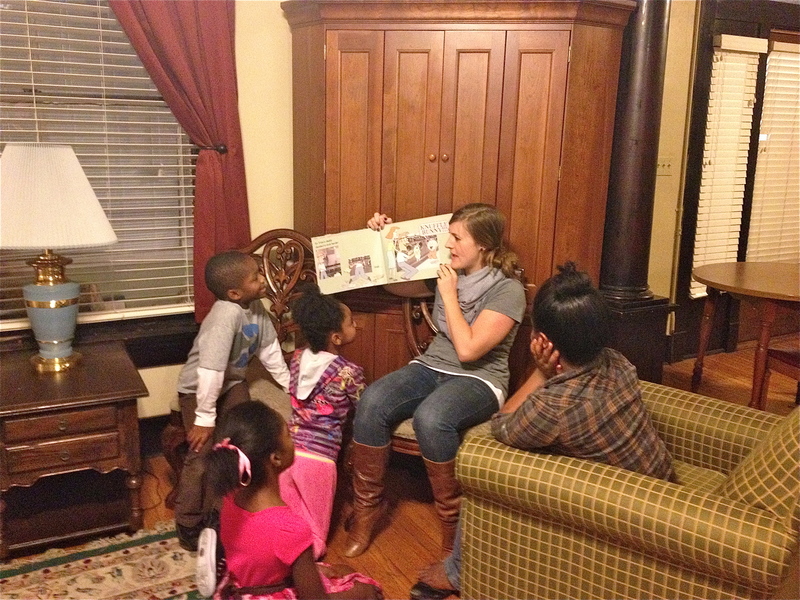 As you read, there’s interest in starting a conversation group at DeNeuville in the evenings with native English speakers. It’s a great opportunity to learn about other cultures while also providing help with English. Let me know (sarah.petschonek@gmail.com) if you’re interested! This would be a GREAT learning and volunteering opportunity for teenagers. They’ll happily accept food donations, paper towels, baby formal, etc to distribute to their students. Come to an event. Did you know the Color Run supported DeNeuville? Keep your eye out for other upcoming events.